Melting of polar ice sheets has added 11mm to global sea levels over the past two decades, according to the most definitive assessment so far. More than 20 polar research teams have combined forces to produce estimates of the state of the ice in Greenland and Antarctica in a paper in Science. Until now different measurement means have produced a wide range of estimates with large uncertainties. But sea-level rise is now among the most pressing questions of our time. Polar ice has a tremendous capacity to cause massive rises - with huge potential impacts on coastal cities and communities around the world. But the remoteness and sheer size of the ice sheets mean accurate measurements are a serious challenge even for satellites which have to distinguish snow from ice, and the rise of the land from the shrinking of the ice. The new estimate shows that polar melting contributed about one-fifth of the overall global sea level rise since 1992; other factors include warming that causes the seawater to expand. The study does not seek to forecast future change. Supported by US and European space agencies Nasa and Esa, the research brought together data from satellites measuring the surface altitude, the flow of the glaciers and the gravitational effect of the ice mass to produce the first joint assessment of how the ice sheets are changing. However, Greenland, West Antarctica and the Antarctic Peninsula were all found to be losing mass - and on a scale that more than compensates for East Antarctica's gain. The study's headline conclusion is that the polar ice sheets have overall contributed 11.1mm to sea level rise but with a "give or take" uncertainty of 3.8mm - meaning the contribution could be as little as 7.3mm or as much as 14.9mm. The combined rate of melting from all the ice sheets has increased over the past 20 years with Greenland losing five times as much now as in 1992. The lead author of the research, Prof Andrew Shepherd of Leeds University, said the study brought to an end 20 years of disagreement between different teams. "We can now say for sure that Antarctica is losing ice and we can see how the rate of loss from Greenland is going up over the same period as well," he added. "Prior to now there'd been 30 to 40 different estimates of how the ice sheets are changing, and what we realised was that most people just wanted one number to tell them what the real change was. "So we've brought everybody together to produce a single estimate and it turns out that estimate is two to three times more reliable than the last one." Prof Shepherd said the measurements were in line with climate change predictions. 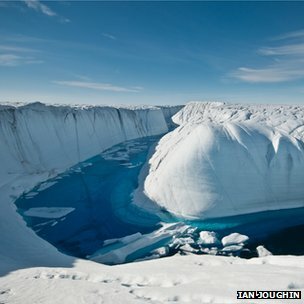 "We would expect Greenland to melt more rapidly because the temperatures have risen," he said. "We would expect West Antarctica to flow more quickly because the ocean is warmer. And we would also expect East Antarctica to grow because there's more snowfall as a consequence of climate warming." Dr Erik Ivins, a co-author from Nasa's Jet Propulsion Laboratory, said one issue that had "plagued" ice-sheet studies was land springing up in a process called "post-glacial rebound" - with effects as high as 1cm per year. But the use of GPS to measure vertical motion and estimates of the ice sheets' movements over the past 21,000 years had allowed the rebound effect to be properly understood. "The new estimates from space gravity for Antarctica's ice sheet loss rates are lowered by using these improved post-glacial rebound models," Dr Ivins said. "The results, then, are more consistent with other space observations that were taken over the past decade. This is one of the major findings in the inter-comparison effort by this international team of scientists." The findings are in line with the broad range of forecasts in the 2007 assessment by the UN's Intergovernmental Panel on Climate Change. And they were completed in time to be considered for the next report, due in September next year. Another author, Dr Hamish Pritchard of the British Antarctic Survey, said: "The next big challenge - now that we've got quite a good understanding of what's happened over the last 20 years - is to predict what will happen over the next century. "And that is going to be a tough challenge with difficult processes going on in inside the glaciers and ice sheets." The research was undertaken as part of the Ice Sheet Mass Balance Inter-comparison Exercise (IMBIE). How much scientific evidence do 'the powers that be' need to reverse what they've set into motion? so true Dave.......You cannot currently send a star to Dave because you have done so within the last week. Thanks for this info! I am sending it to some friends right now. You are welcome Sharon! I'm glad you found it worth sharing. Noted w/much thanks for the info, J.L. Fascinating that this has been amenable to precise measurement, and it puts me in mind of an article in the NY Times, about the melting of ice in Greenland, complete with a photo of tents that were erected on newly bare rock, outside of a hotel in Greenland. Thanks for adding that vivid visual for us to more fully comprehend the impact of this information Mitchell. You cannot currently send a star to Mitchell because you have done so within the last week. You are welcome a y.